Sub:- Implementation of Govt's decision on the recommendations of the 7th CPC-Revision of pension of pre-2016 pensioners/family pensioners etc. and para 19 of PCDA(P) Allahabad circular no. C-164 dated-30/05/2017. 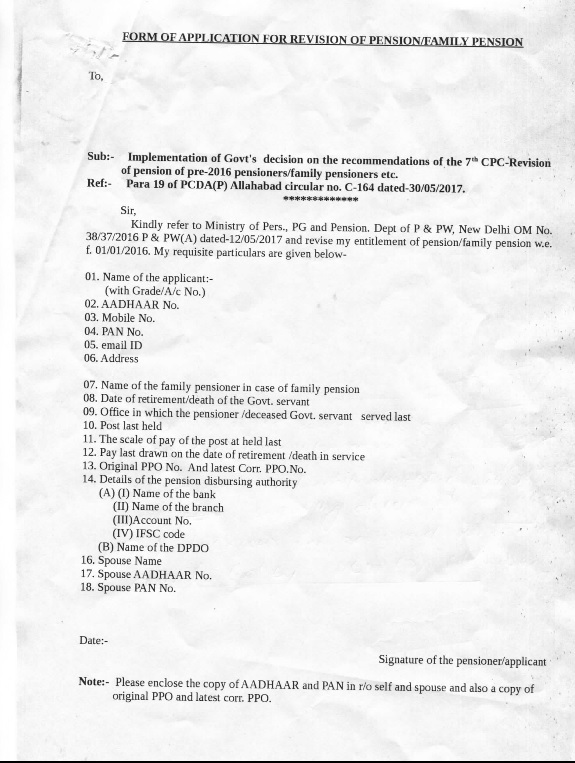 Consequent upon Govt's decision on the above subject, all the pensioners of defence, accounts department who retired before 01/01/2016 from the organisation of PCDA(CC) Lucknow are requested to submit the requisite information on enclosed proforma in duplicate along with, all supporting documents to PCDA(CC) Lucknow for revision of pension as per 7th CPC. Sub:- Implementation of Govt's decision on the recommendations of, the 7th CPC-Revision of pension of pre-2016 pensioners/family pensioners etc. Ref:- Para 19 of PCDA(P) Allahabad circular no. C-164 dated-30/05/2017. 13 Original PPO No. And latest Corr. PPO.No. Note:- Please enclose the copy of AADHAAR and PAN in r/o self and spouse and also a copy of original PPO and latest corr. PPO.